Jayne Blanchard's work as a journalist and editor has appeared in "The Washington Post," "Psychology Today," "Brides," "Newsday," "USA Today," "Cosmopolitan," "ADAM," "Style" magazine and myriad other publications. In addition to writing about health, travel and women's issues, she has also worked as a movie reviewer and theater critic and holds a Bachelor of Arts in English from the College of Notre Dame of Maryland. 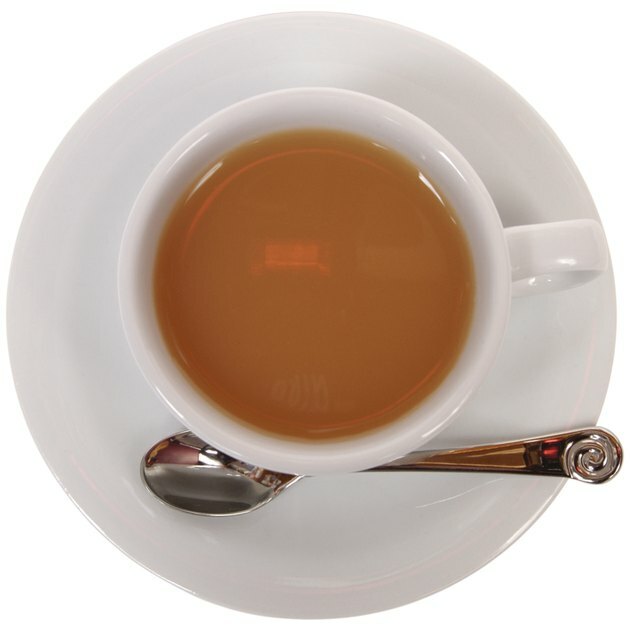 Reach for a cup of tea when your stomach gets upset or bloated after a big meal. A post-prandial cup of herbal tea provides a natural, time-honored remedy for noisy and poofy tummies without the side-effects of manufactured chemical compounds. Try mint, chamomile or ginger. Herbal teas should never subsitute for professional medical treatment for stomach issues; if bloating persists or worsens, you need to see a doctor. A member of the mint family, tea made from lemon balm calms the system, according to the University of Maryland Medical Center website; it alleviates gas pains and bloating from indigestion. This plant, originally from Europe, has been employed to soothe a variety of ailments since the Middle Ages. Lemon balm's relaxing effects on the body can be attributed to two plant chemicals, terpenes and eugenol. Often, tea makers combine lemon balm with valerian, chamomile and hops to enhance the brew's soothing capabilities. Teas containing peppermint can ease upset stomachs and allow the passing of painful gas, according to the University of Maryland Medical Center website. Stomach muscles relax as a result of drinking peppermint tea, which also boosts the flow of bile, a substance that helps the body process fats. Many scientific studies support using peppermint for indigestion; however, if your stomach issues are caused by gastroesophageal reflux disease, peppermint tea is not recommended. This mild herb can serve as an anti-spasmodic, lessening the cramps and pains of intestinal and stomach woes. Chamomile tea gently sedates and quiets flares in the mucus membrane of the digestive tract, relieving heartburn symptoms and flatulence. If you suffer from ragweed allergies or if asters and chrystanthemums make you sneeze, chamomile tea may aggravate these sensitivities and cause an allergic reaction. Reach for the ginger tea to quell queasiness and bloating caused by overeating or fatty meals. A potent anti-nausea remedy, ginger tea also treats ailments caused by gas. Ginger is considered a warming herb that generates heat in the body; this heating ability is thought to help get overloaded digestive systems back in balance. You may find that the combination of warm tea and warming ginger creates an uncomfortable sensation for a dodgy stomach; if so, drink more cooling mint or chamomile teas. Does Hot Tea Help Bloating and Gas After Meals? What Are the Health Benefits of Mint Tea? Is Peppermint Tea Safe in Early Pregnancy?